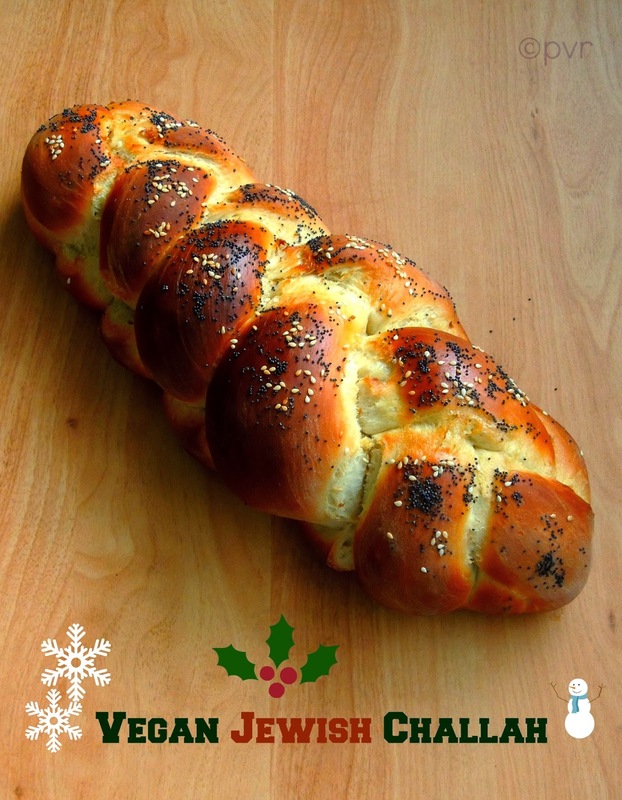 Challah, the popular Jewish bread is loaded with eggs and egg yolks, but if i say we can make beautiful challahs as vegan version, its unbelievable rite. Even i was bit skeptical when i saw this Vegan Challah from The Sweet Life, an another incredible bread challenged by Priya R of Cook Like Priya for this month's Home Baker's Challenge, a monthly baking event where we bake varieties of bakes every month.Since december is a month of Christmas celebration, Priya chosed many delicious christmas bakes from all around the world and am happy that finally i can make my favourite challah as vegan version. Seriously until i finished baking this challah am not sure about the texture and the taste,but trust me this vegan challah is just tremendous. Crust and the texture of this bread came out extremely prefect as much as like the egg loaded challah. This Veganised challah goes for chickpea flour which may sounds weird but seriously the addition of chickpea flour makes this bread interesting and this flour gives the texture and that mild yellowish colour to the texture of this vegan bread. I enjoyed thoroughly baking this Christmas veganished Jewish bread at home and once again thanks to Priya for challenging us this incredible bread.Today is the last thursday of the month and its time to post for Vegan Thursdays, an vegan event running twice a month and this beautiful challah goes to this event too. One pot meals are always prefect for lunch. Either its a sunday's lunch or a week day's lunch,one pot meal are really easy to get ready and prefect to serve for a get together. Coming to today's coriander soya pulao, this pulao goes for an easy preparation with the aromatic herb aka coriander leaves. To add the nutritional value of this pulao, i simply went for the protein rich soya chunks for making this one pot meal. 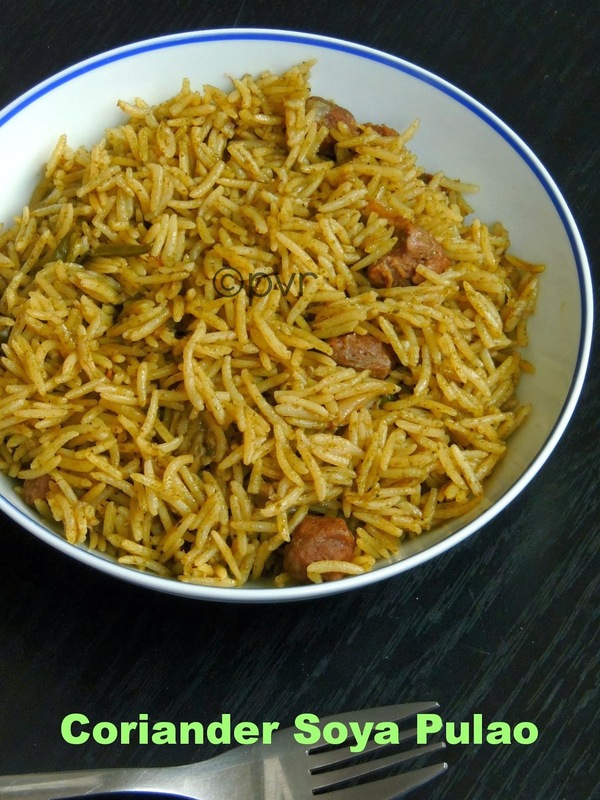 If you want to make this pulao with meats, just go with lean meats like chicken or else with prawns. Aromatic coriander soya pulao suits prefectly for a sunday brunch, i served this rice with a simple potato kurma and we just enjoyed thoroughly our lunch. Its 4th sunday of the month and since i belong to a group of friends who blogs on sunday for the event Let's Brunch On Sundays am posting this incredible delicious pulao. Good friends are very rare but believe me even this virtual world brings you many wonderful friends,eventhough many people around you may says that never trust this virtual world. Even i was before as though, but slowly i changed that opinion and trust me apart from few, most of the bloggers i crossed in this virtual world are genuine,down to earth and with huge heart. When i started this Rendez vous with a foodie event, a bunch of new bloggers joined their hands immediately with me and this event is running very successfully since ever i started this event. 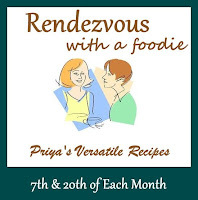 Every 7th and 20th of the month,am hosting Rendez Vous With A Foodie, an event happening twice a month in my blog,the main motto of this event is to introduce budding bloggers to this immense virtual world.Today is an another special day for me,yep today's host is a wonderful person, before going to know about her, if anyone want to be my guest and if your blog is less than two years please do contact me through Facebook or by a mail with your facebook name to add you in this new adventure. Veena, her blog speaks a lot about her passion for cooking and blogging.She share many South Indian dishes with stepwise pictures and none will go wrong with her instructions. I have became an ardent fan of her way of cooking with healthy stuffs,traditional foods and wonderful eggless bakes. Seriously if you go through her space, am sure you will definitely fallen in love with her space. Veena, who blogs at Great-secret-of-life eventhough i dont know much about her, slowly i came to know that she is not only a sweet person and a very down to earth human who supports everyone with her constant visits and her encouraging words.Everytime i go to her space, i always amazed to see the varieties of dishes she shares in her space and now am an ardent of her space. Biryani,this word itself makes me hungry, we love biryanis not only for the special occasions. Mostly we love to enjoy them for our sunday lunch.When i was searching for a new biryani, i googled for it and i ended at Asiya Akka's Samaithu Asathalam and picked her Parangipettai biryani. Instead of mutton, i went for chicken and followed her recipe prefectly. Seriously this biryani turned out extremely delicious and very flavourful, this Parangipettai briyani goes for a special spice powder which goes for white pepper, poppyseeds, cumin seeds, cardamom, cinnamon stick and cloves. This spice powder enhances the flavor of this biryani and we seriously enjoyed this beautiful biryani for our sunday's lunch. 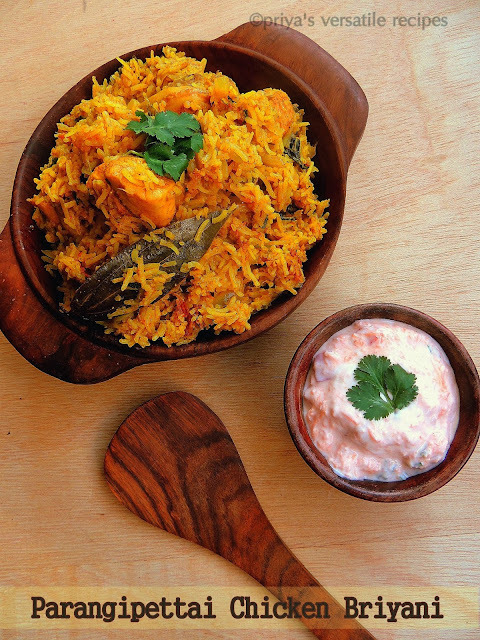 Thanks to Asiya akka for sharing this flavourful Parangipettai biryani, and learned a new biryani from you. Xmas is around the corner and many of us will be getting ready to have a fabulous xmas and new year party. This time am not at home and happy that am in India to have those celebrations here. However i'll be missing our usual Xmas feast and New year bash with my H and kids.For this month's Home Baker's Challenge, a monthly baking event, Priya R of Cook Like Priya suggested us many wonderful xmas themed bakes from around the World. 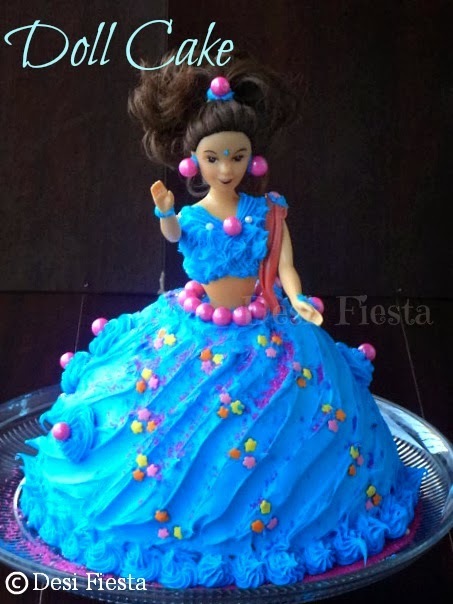 Her choices of challenges are just amazing and she chosed varieties of cookies, breads and cakes which suits prefectly for the Xmas celebrations. This baking event,which we started before few months have been successfulling going around with loads of supports from the members of this group,thanks to each and everyone for being a part of this huge success..Xmas celebration table will always have wonderful foods, bakes and desserts, i cant imagine my xmas party without cakes or cookies. Everyone year i'll prepare rich fruits cakes and this time i opted for this snowman cookies from the recipes suggested by Priya. Look at those cute looking snowman cookies, the picture itself speaks a lot na, trust me these cuties are dangerously addictive. 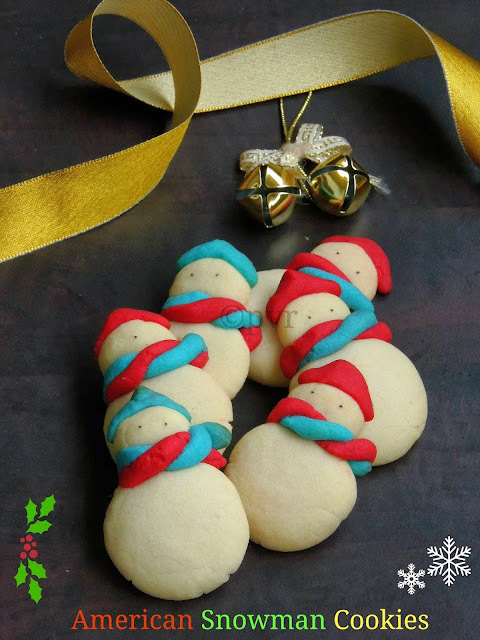 My kids gone crazy once they saw these cute cookies, they just enjoyed thoroughly these eggless beauties.Very prefect eggless butter cookies for the Christmas celebration if you dont eat eggs. 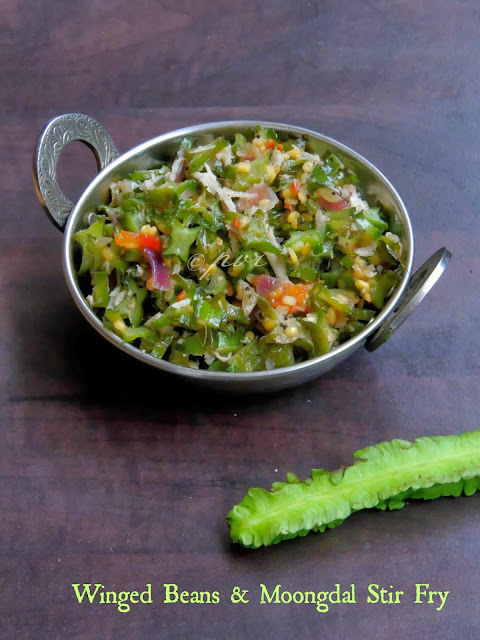 Bhindi is also known as Okra or ladys finger, is a protein rich vegetables. Eventhough this sticky vegetable was one of the most hated vegetable by kids earlier, i never forget to get them from Indian stores. Slowly my kids started loving this vegetable, watelse a mom need. I'll prepare atleast a dish with bhindis once a week and this vegetable is must to buy whenever we go to Indian stores.One of my recent favourite,nope my family favourite with this vegetable is this pachadi. This pachadi tastes fabulous to enjoy with a simple pulao or biryani, i served this nutritious pachadi for our sunday lunch with Ambur Mutton Biriyani.Bored of usual onion raita or simple cucumber raita, make this delicious okra raita/bhindi pachadi and surprise your family members.Its 1st sunday of the month and since i belong to a group of friends who blogs on sunday for the event Let's Brunch On Sundays am posting this healthy pachadi.Sending to my own event Healthy Diet-Vegetarian Side dish guest hosted by Nandoos..
We might have crossed so many friends in our life, some may stay and some may go but some will never go and they will stay in our heart for ever. This blogging world brought me many friends who later became my virtual sisters and the number of virtual sisters are increasing day by day, but never mind i just adore the support and the love they brings me. Whenever i ask their support, they will definitely shower me with their huge support, thats why i created this event Rendez vous with a Foodie. I know i can trust my co-bloggers aka my virtual sisters to join their hands to make this event and trust me they proved that and this event is a big hit. I have to say big thanks to each and everyone for giving me this support. If you are my follower,you might have noticed that every 7th and 20th of the month i'll be introducing a newbie blogger to this immense virtual world.My today's guest is known other than Rafeeda of The Big Sweet Tooth, a wonderful person, absolutely a very sweet sister who cares a lot for others. Earlier i thought she might be a homemaker who cooks quite often then later from her posts i came to know that she is a working mom with two adorable kids. I was astonished to see how frequently she blogs and participates in many challenges eventhough she is busy working mom. Initially, her blog's name attracted me a lot, coz am also having a big sweet tooth. When you saw someone who is having the same taste and same passion for foods obviously you will get attract to them and you may turn curious to know more about them.This is wat happened for me when i crossed Rafeeda's space, happy that she is an adorable person who have a huge heart thus i simply became her ardent fan. Actually I always love her Malabar dishes and obviously i was waiting eagerly for her guest post. Trust me, she didnt disappointed me and send me a wonderful,droolworthy Malabar Biryani. Thanks Rafee Sis, coz of you finally my space have a wonderful Malabar biryani now. My followers knows very well that i make quite often sprouts with beans and seeds at home itself. For sprouting we dont need any specific container. A small bottle container and a dark place can make some magic also you need patience for sprouting,coz sprouts may take more than two days while some may take three days to sprout. Recently i prepared few fenugreek sprouts at home, after making some instant pickles and spicy tamarind based gravies aka kaara kuzhambu finally i prepared this incredible dal powder using some leftover fenugreek sprouts and dals. Actually this is the first time am trying a paruppu podi with sprouted fenugreek seeds,trust me this podi turned out extremely fabulous with a mild tolerable bitterness. Am having twice a week this podi mixed with rice topped with gingelly oil or ghee. Sprouted fenugreeks, we call in tamil as mulaivita or mulaikattiya vendhayam(முளைவிட்ட வெந்தயம்) tastes less bitter when compared to the fenugreek seeds. Anyhow this bitter better seeds are seriously very healthy and definitely a diabetic friendly dal powder which helps to reduce the sugar level in blood by frequent intake.Today is the first thursday of the month and its time to post for Vegan Thursdays, an vegan event running twice a month and this healthy dal powder goes to this event too. Writing a guest post or getting back a guest post is quite common in this immense virtual world, but getting a guest post from a close friend is more than that. Actually Menaga of Sashiga is one of my best buddy i got through this blog world, we get connected through our passion for foods and later i came to know that she is also from Pondicherry my native and for my surprise she lives also near Paris,how wonderful na. Then one fine day, i asked her fone number and started talking with her through fone. From that onwards, the bond between us is just growing on day by day. She never failed to call me and as usual we talk for hours, even everyone at home pulls me for our long conversation we have mutually with each other. 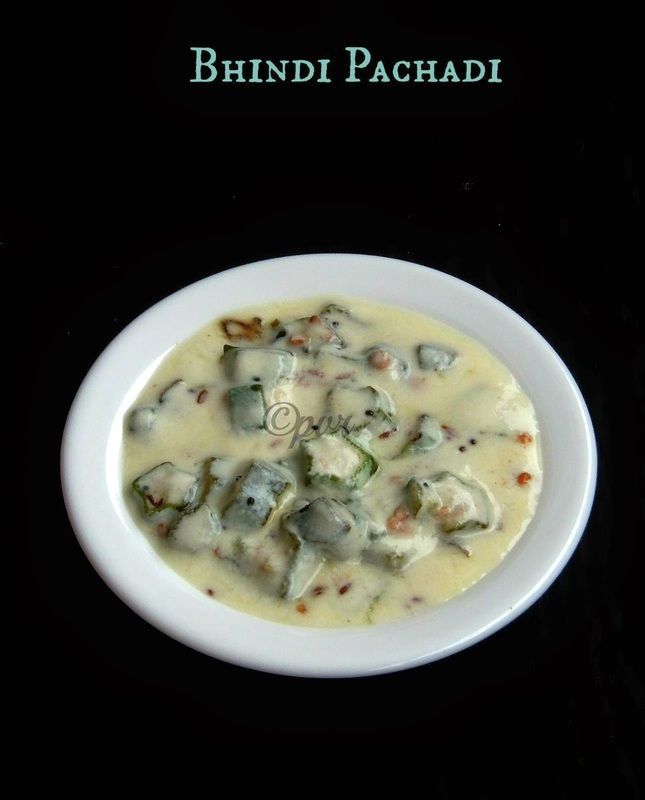 Few days back, i asked Menaga to write a guest post for me, she immediately asked me whether i need anything special, i simply replied to send me a dish that suits prefectly to showcase our native Pondicherry. She said ok and send me within a day her inlaws signature dish. Coming to to Prawn pepper kuzhambu, we make prawn kuzhambu at home often as we are the great fans of sea foods, but Menaga's prawn pepper kuzhambu was completely different from mine. 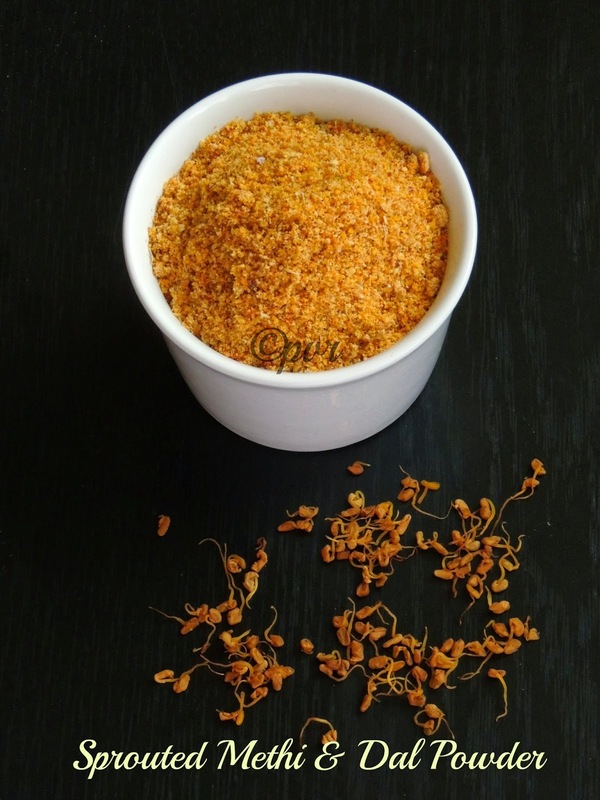 Seriously cant wait to make this fingerlicking kuzhambu at home. 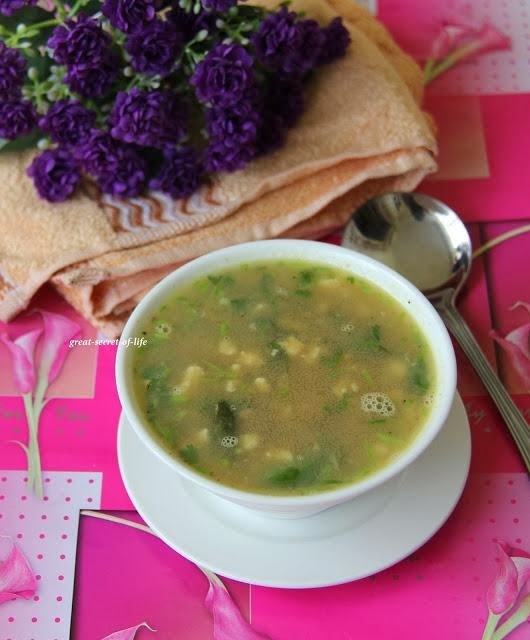 Actually this gravy goes for the famous South Indian tempering spice called vadagam, which is prepared yearly once with a variety of spices with onions. This sun dried tempering spices gives a wonderful flavour to any tamarind based gravy makes them more flavourful, obviously we used to carry them from India everytime during our visit to India. If you want to make a new variety of kuzhambu, you should give a try to this delicious Menaga's Prawn pepper kuzhambu. After dishing out some Italian foods, for this month's International Food Challenge ,a monthly event started by two wonderful food bloggers Sara and Shobana, the members of this food challenge group travelling towards Rajasthani cuisine of India.Rajasthani cuisine, the foods from this cuisne are prepared usually with milk, yogurt and buttermilk coz of the scarcity of water of the region of Rajasthan. Most of their foods last for several days coz of their traditional warrior lifestyles and depending upon the availability of the ingredients of this water starved ragion.This cuisine is a splendid array of unique,rich,colourful,spicy dishes and many more delectable sweets. Lentils and legumes like jowar, bajra are used very much in this cuisine and needless to say Gramflour is one of the main ingredient in this cuisine. The traditional Rajasthani dishes with vegetables can be eaten for many days and they dont need refrigeraton coz of the weather condition of this region. This month's host was Manjula Bharath of Desi Fiesta, since she is from Rajasthani region she challenged the members with many delectable Rajasthani dishes, one among her challenge was her delectable Rajasthani Festive Platter. When i saw the spread i was awestruck, yes the platter she prepared was just mindblowing, can see her efforts and her love for her native. 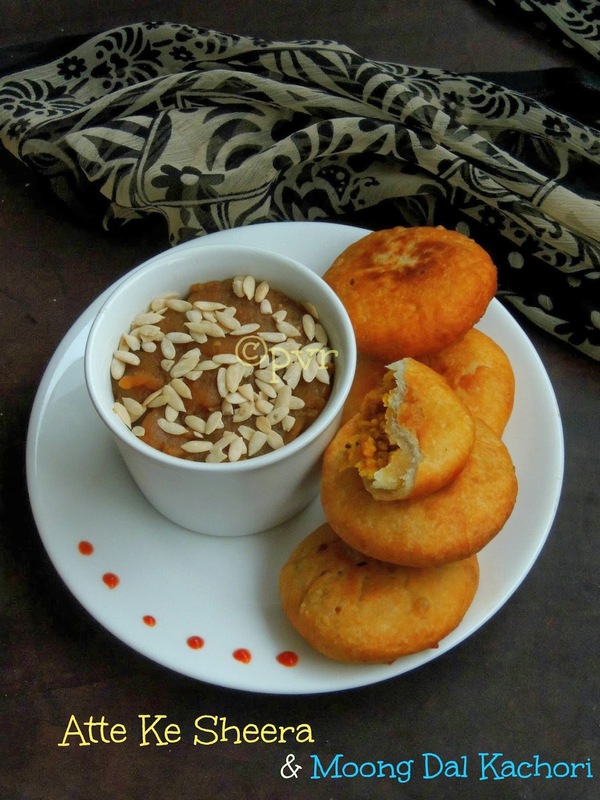 I chosed to cook a Halwa and a Kachori from the dishes she challenged coz of the lack of time coz i'll be in India while this post is up.Thanks Manjula for challenging us with delicious Rajasthani dishes, trust me i enjoyed making and having both halwa and kachori. Winged beans, i have seen them since ages, thank god finally i saw them at Indian store during our last trip. Nowadays we can able to see super fresh Indian vegetables very much frequently in Indian stores, happy for it, but trust me the prices are seriously very expensive. If we want good Indian foods at home, we shouldnt count the money na. Coming to this recipe, its a simple but a delicious stir fry i usually make at home. Except i went for winged beans, these beans will have a crunchy texture even after cooking, this makes the difference between this winged ones and the normal beans. Winged beans are also know as Goa beans, Asparagus pods, four angled bean and winged peas, in tamil we call it as Sirahu avarai (சிறகு அவரை ). You can make pickle with this winged beans which tastes simply fabulous too, but somehow i sticked to the usual stir fry as am cooking this winged beans for the first time here in Paris.Sending to my own event Healthy Diet-Vegetarian Side dish guest hosted by Nandoos..
Have you ever tasted parottas with fingerlicking salna when the weather is down, if not seriously you are missing something. Salna and parotta makes a prefect pair and one of most famous salna is chicken salna, the roadside shops serves this fingerlicking side dish with hot flaky parathas. 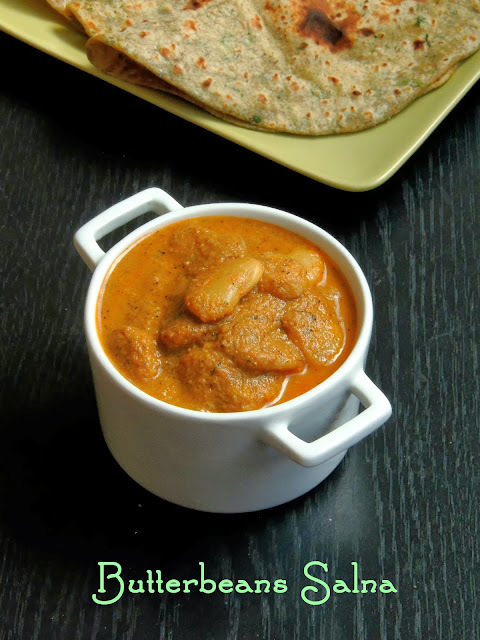 Usually people prepare salna with mixed vegetables,eggs or chicken, for a change today i prepared this salna with some pressure cooked butter beans.We love parathas very much especially for the salna we get from the restaurants, coz this salna tastes extremely delicious with idlies or dosas. Obviously we buy less number of parottas and ask for more salna. Coming to this butterbeans salna, this side dish gets ready very much easily, you can go for any beans if you dont have or dont like butterbeans.Along with beans you can also add veggies too if you want to make your salna more healthy and tasty,however salnas can be made with anything eventhough my favourite is always Egg Salna.Today is the first thursday and its time to post a vegan dish for Vegan Thursdays, an vegan event running twice a month, am posting this fingerlicking,nutritious butter beans salna for the event. Life is bit lazy nowadays may be coz of the weather, its raining nonstop or else its too chilled to go for a walk, all i want id to sit at home next to a heater. Coming to today's guest post, this cute looking avocado muffins with chocolate chips goes to Savitha's space. Savitha, we chitchat rarely but she is a wonderful person who never failed to make me smile. She is so friendly, very jovial and one more down to earth person i crossed in this immense virtual world. Thanks to this bloggy world,i have wonderful peoples around me.Savitha asked me to write a guest post for her,before am leaving to India.She didnt asked me any specific category and when i asked whether she want stepwise pictures, she was kind enough and said to stick with my style of clicking.Without any hesitation, i went for a baking that too with my favourite Avocado. Avocado works wonder in bakes, i have already tried making a brioche with it. 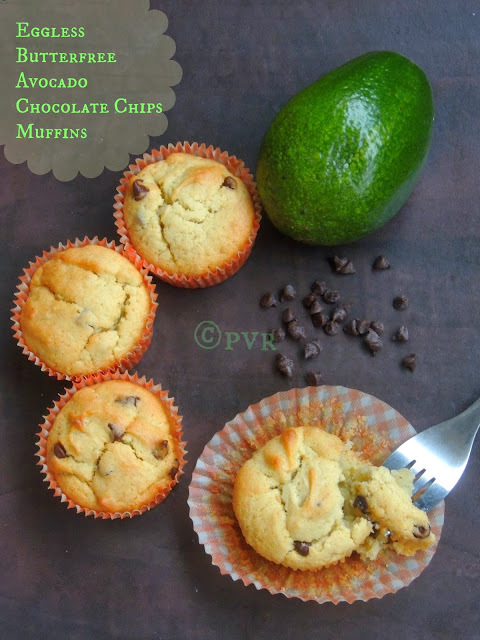 Apart from making shakes and salads, you can use avocado very well in your cakes. Avocado puree replaces very well the fat content in bakes like butter,oil or shortening. As usual since i dont want to run behind the eggs,i prepared this fabulous looking muffins as eggless and butterfree. Want to bake this cuties, dont forget to check at Savitha's Space.. Instant idlies or dosas are very quick to make and really easy whenever you feel lazy to cook.After an instant wheat dosa and super healthy red rice flakes and wheat rava idli, here comes an another interesting dosa. Since i want to make an easy breezy instant dosa with simple ingredients, i went for maida and rolled oats. This instant dosa is seriously very quick to make, just mix the flour and oats together with enough water,spice it with green chilly, cumin seeds with salt, your dosa batter is ready to make dosas. A spicy chutney makes a prefect pair to serve along with this quick instant dosas, i served mine with ginger chutney.Since i chosed instant dosas or idlies as theme for this week's blogging marathon, am posting this instant maida oats dosa as this dish suits prefectly for the theme.Check out the Blogging Marathon page for the other Blogging Marathoners doing BM#34. 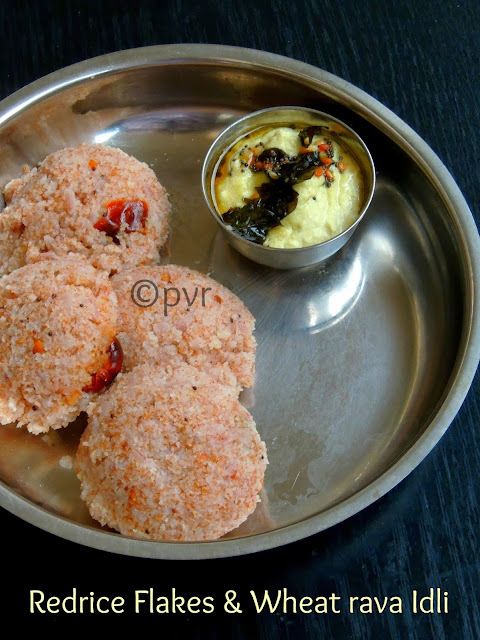 After a simple and easy breezy wheat dosa, here comes an another interesting and a diabetic friendly instant version of idli i prepared simply with red rice flakes and wheat rava. Trust me this instant idlies are just fabulous, they are extremely quick to prepare too. 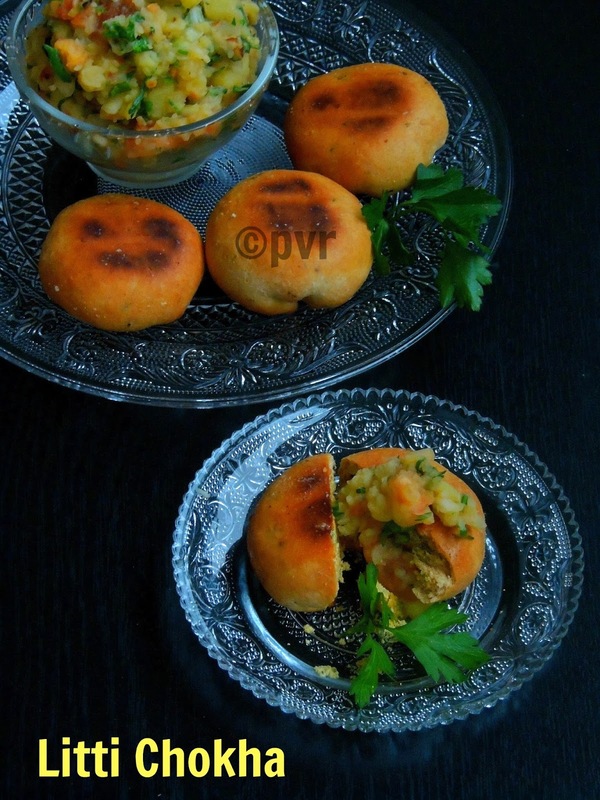 With a spicy coconut chutney, am sure this idli will definitely satisfy anyone's tastebuds. Since i chosed instant dosas or idlies for this week's blogging marathon, i cooked this gorgeous looking delicious, healthy idlies before few days for my dinner. You may wonder how this idly will be in taste and texture, i didnt find my difference between the usual instant wheat rava idlies we do quite often but tastewise red rice flakes gives a wonderful taste and these idlies are extremely fragile.As am having hard time with day light now, i removed the warm idlies from the cooker to take this picture, that y my idlies looks bit crumbly, but trust me once they gets well cool they are prefect in shape.If you want to make a different instant idlies, am sure this idlies is a must to give a try.Check out the Blogging Marathon page for the other Blogging Marathoners doing BM#34. After baking a 100% wholewheat bread, for this month's of We Knead To Bake, a monthly baking event by Aparna of My Diverse Kitchen,we are baking the humble cinnamon buns or cinnamon snails. Kanel Snegle/Kanelbullar,this Swedish cinnamon buns are tremendous and they have spices like cardamom and cinnamom. Cardamom is used in the dough and cinnamon is used inside the snails/buns as filling. Actually cinnamon snails are the coiled shaped buns while twiste buns are twisted dough and rolled up on depends upon the shape you go for. 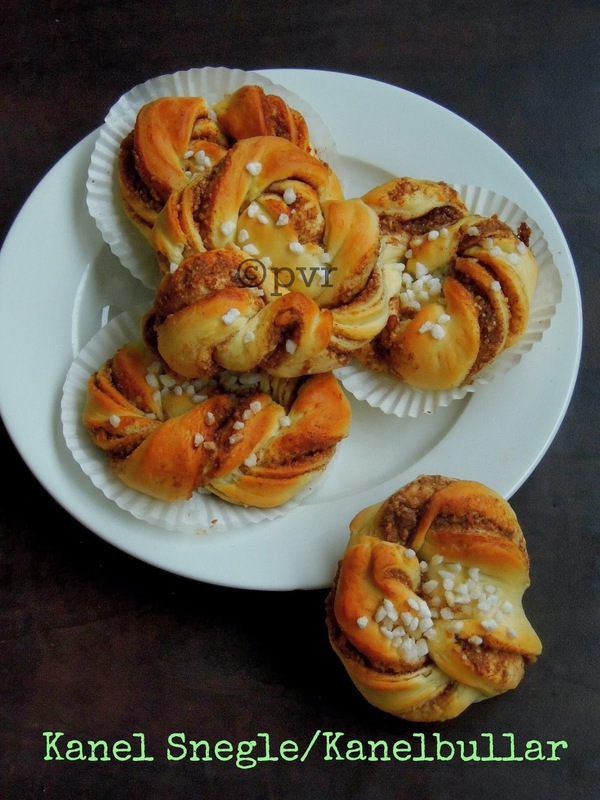 This Swedish Kanel Snegle/Kanelbullar are traditionally made on 4th October every year in Sweden to celebrate the day of Cinnamon buns but you can find them in bakeries throughout the year there. Aparna suggested us to make both snail shaped cinnamon rolls and the twisted once,since i want to try the both shapes, i prepared the both the snails and twisted buns. Seriously i loved making this Swedish cinnamon buns at home since cinnamon buns are our family favourite. 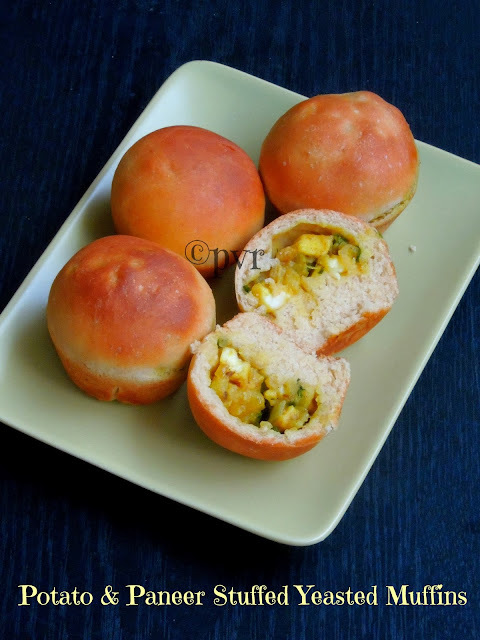 I prepared the starter, which is quite important for making this bun the day itself Aparna posted the challenge in our group and i prepared the next day this both shaped buns with cinnamon and almond powder filling. If you want to stick with the usual cinnamon filling you can skip the almond powder addition here.And one of the best part of these buns,you can freeze them very well, just heat them in microwave oven and enjoy with your cup of tea.If you are planning to make this cinnamon buns, just start making the starter before a day. Instant dosas or idlies are really handy and definitely saves us when we run out of the Idly batter. For this week's blogging marathon i chosed instant dosas or idlies as theme and the next two days are going to be healthy, quick and instant versions of dosas and idlies. Coming to today's recipe, its definitely a quick and very healthy dosas we prepare quite often simply with wheat flour and rice flour. 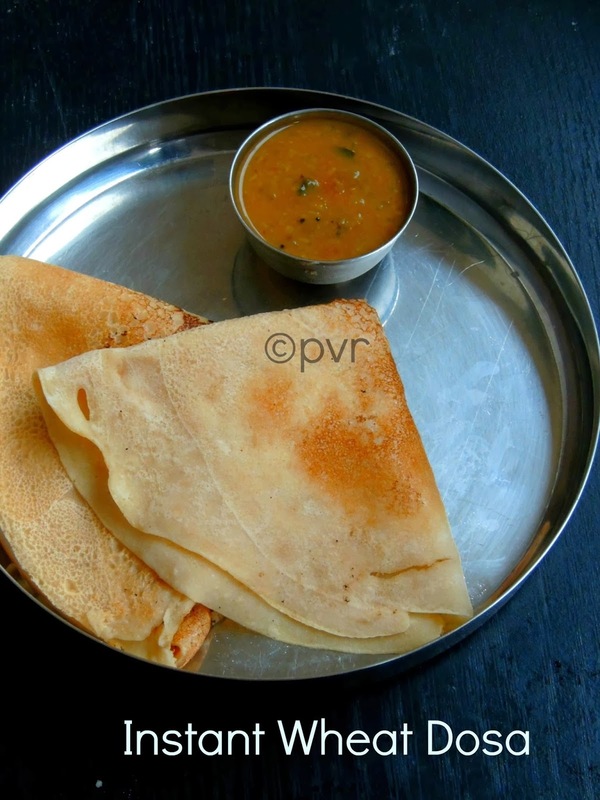 This dosa makes a super filling dinner or breakfast if you serves them with a simple chutney or sambhar. Personally wheat dosas are my favourite, since am yet to post this instant dosas in my space, i prepared them few days back for my lunch and enjoyed with some tomato sambhar. My H and kids dont like these kind instant dosas or idlies that much,but who cares i'll make them specially for me.Earlier i insisted them to take these healthy foods, but it never worked with them. Obviously if i want to feed them with wheat flour in dosas, i'll add some flour in the sour dosa batter and makes wheat uthappams with loads of onions.This way they will eat without any fuss. However when i chosed this theme for this week, i know am gonna have feast with my favourite instant idlies and dosas. Check out the Blogging Marathon page for the other Blogging Marathoners doing BM#34. 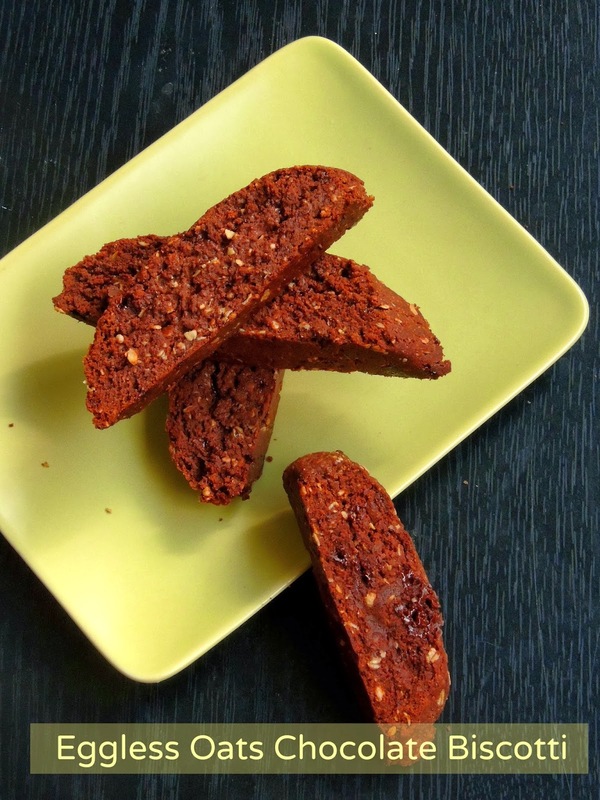 Biscotti, this twice baked Italian cookies are prefect evening teatime snacks and they tastes fabulous along with a hot chocolate or our Indian masala chai. For this month's Home Baker's Challenge, i chosed biscottis, coz these famous Italian cookies are rarely baked in our households. Since i want to make both savoury and sweet biscottis, i suggested two different savoury and two different sweet biscottis for the challenge. 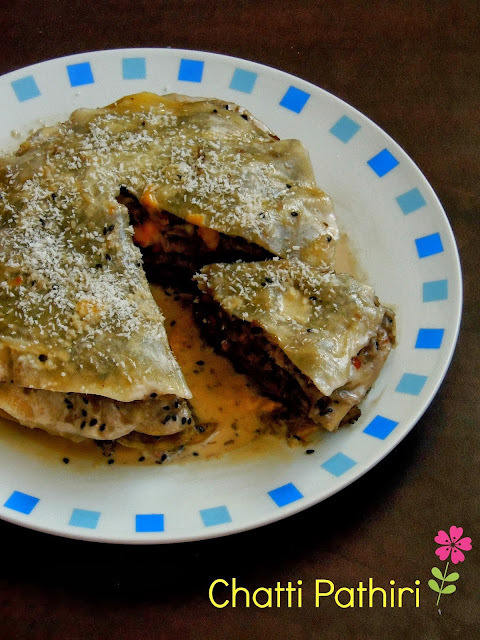 I have already posted the one among the two sweet biscottis i have suggested and here comes one of our recent favourite savoury biscottis. Mediterranean cuisine, they are well known for their different cuisines from countries like Albania, Egypt,Greek,Israel,Italy,Morocco, Spain and Turkey. Obviously this cuisine goes for different spices and they are quite famous for their aromatic dishes. Mediterranean cuisine is very close to my heart, coz am a big fan of Moroccan,Spanish and Italian cuisine. Since my kids asked me something savoury,i immediately baked these Savoury mediterranean biscottis for their evening snacks. Seriously this biscottis are simply fabulous, spicy, aromatic and very addictive coz of the cheese,dry herbs and the pepper powder they went for. These savoury biscottis goes awesome with any spread or else you can simply munch them. 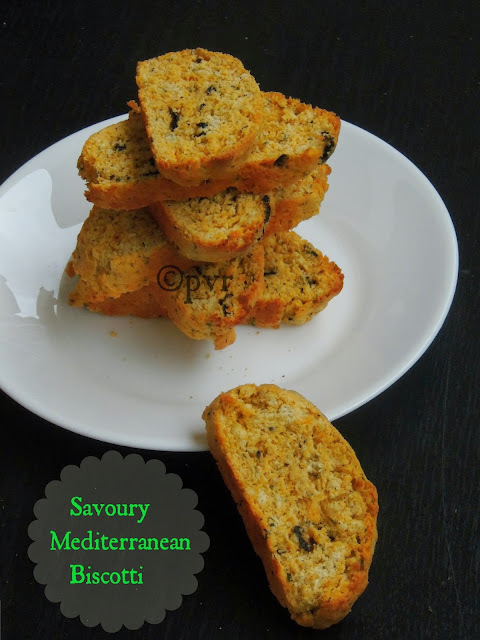 I skipped the sun dried tomato in this recipe and went for yellow cheddar cheese instead of parmesan cheese.Make this savoury biscotti for your snacks, am sure you wont stop just with one. Pannacotta is a famous Italian dessert prepared with cream,milk,sugar and along with gelatin or agar agar (a vegetarian gelling agent). 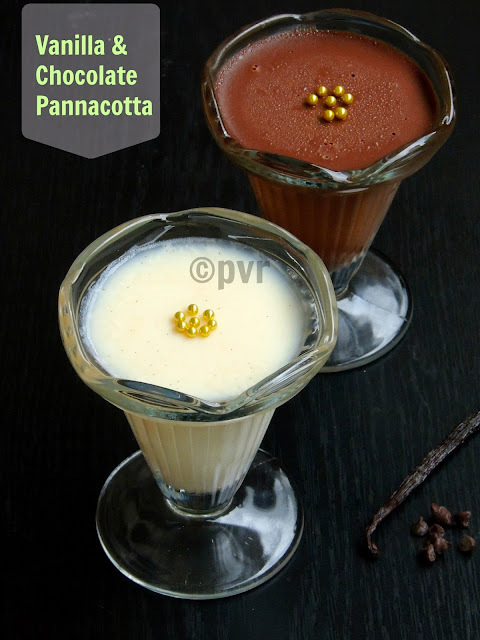 This Italian dessert tastes fantabulous when the weather is too hot as they are usually served chilled.Today am sharing a chocolate and a classic vanilla pannacotta prepared with Madagascar vanilla pods which i recently got through a friend who came back from Madagascar island. Obviously vanilla panna cotta prepared with Madagascar vanilla pods seriously makes a huge difference, tastewise they are just unbeatable and absolutely delicious.However my favourite is always chocolate flavoured one,yes i love chocolate pannacotta very much.For a light version of this pannacotta, you can use low fat milk and low fat cream,which tastes truly delicious too. Pannacotta is an another dessert suggested by Preeti of Simply Tadka for this month's Sweet Fantasy Club where we can learn many sweets and desserts.Do you love to learn making sweets at home, then you should join this group. 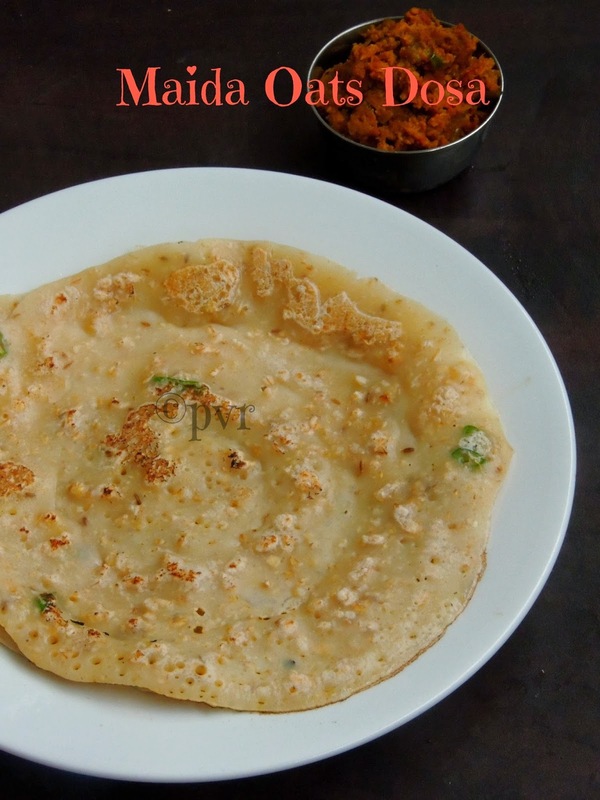 Malpua is an Indian style pancake prepared with maida and well reduced milk batter, later this batter goes for deep frying. Once fried, these malpuas will take a sugar syrup bath before serving along with rabri, an another Indian sweet prepred with milk.I always want to make malpuas at home especially during Diwali, but unfortunately i havent tried my hands in preparing them at home. 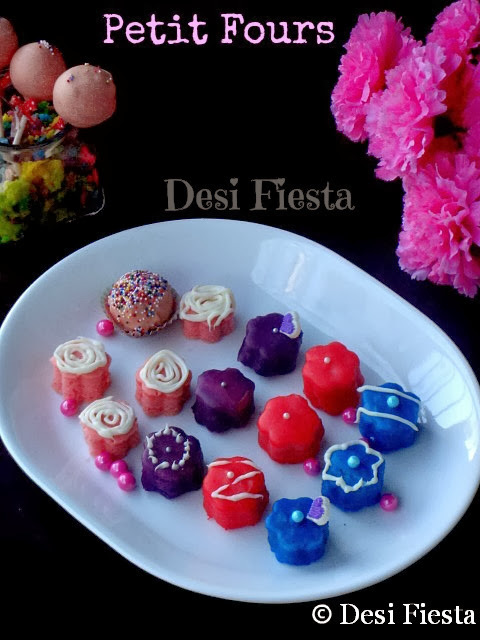 Thanks to Preeti of Simply Tadka for suggesting this beautiful sweet for this month's Sweet Fantasy Club where we can learn many sweets and desserts. 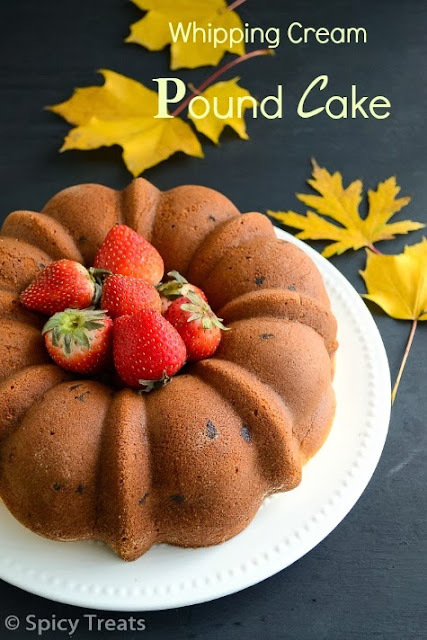 Actually this sweet club is open to whoever have sweet tooth and love to learn many different variety of sweets and desserts.Every month, the members of this group cook two different sweets or desserts and blogs about it on their blogs. One of the sweet challenged in the group goes for Indian sweets and the second one goes for International or fusion desserts, seriously i dont want to miss this chance to learn different sweets and joined the group immediately. After Rajbhog, this month i learned to make malpuas at home. Trust me this sweet fried pancakes are dangerously addictive, if you make them at home am sure you wont stop just with one. I enjoyed thoroughly making these cuties at home. Once again thanks Preeti, for pulling me to make malpuas finally at home. Coming to today's host, she is a one of my soul mate again, actually i dunno anything about her a year back. I came to know about her only through SN Challenge, an event by Divya Pramil when she challenged us with the famous Rajasthani Ghevar, its was like hi and bye relation before. Suddenly we came closer through FB coz of guest post by Sangeetha of Spicy Treats,from that onwards we started chitchatting, then only i came to know that Manjula is a Rajasthani gal who speaks tamil,my mother tongue fluently. She is also very special to me as much as like my other virtual family members, my bubbly sister who never fails to make me laugh by her naughtiness. Do you how she was inspired to start her blog? ?, she told that am the one who inspired her.Trust me, that day i was like a person who won a jackpot, watelse a food blogger need. Inspring a foodie to start a blog,thats seriously something special na and its was like an achievement for me. Manjula, a super jovial person who speaks tamil like a pakka chennailite never failed to amaze us with her frequent blogging, that too she is a Thali queen who challenged a complete Rajasthani Thali for the SN Challenge, am happy to say that through her i learned many Rajasthani delicious dishes. With a toddler at home,she is a busy mom but still she cooks easily a Thali and will surprise you. Do you know for Onam she prepared an Onam Sadya Feast.Seriously its rare to see an enthusiastic person like her in this virtual world. Manjula have her own way of cooking and makes anybody to drool in front of her pictures. Needless to say about her pictures, you may think that she own a DSLR,nope she is capturing her food clicks with P&S, whoever go through her pictures wont trust that her pictures are clicked with a P&S. She proved that we doesnt need a DSLR for food photography even with Powershot we can make magic. Today am very proud that she is my guest host today, its was so special and very emotional moment for me. Thanks Manjula for making a beautiful guest specially for me. Rice is a staple food of South Indians, everyone at home can have pastas everyday, but for me rice is important and i'll love to have atleast once for a day. Sometimes i make pastas to others and keep a bowl of rice aside for me to have just with curd and pickle, yes i like rice that much. Today's recipe is a delicious, flavourful one pot meal i quickly prepared for packing my H's lunch box few days back. 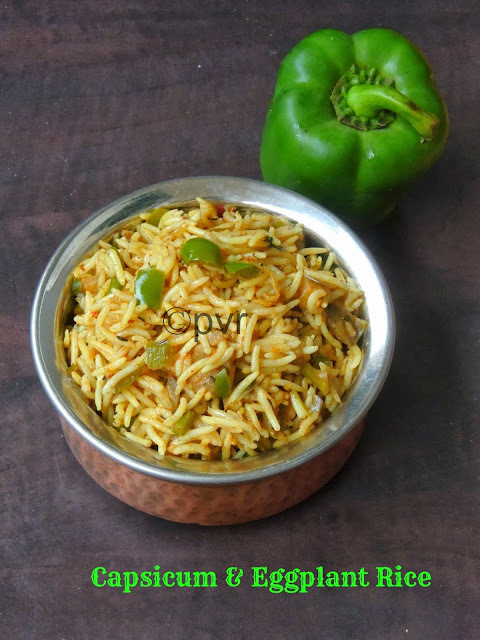 This rice is an easy breezy,quick dish if you have cooked leftover rice at home.Finely chopped eggplants and green capsicum makes this rice more flavourful and delicious. Name it as masala rice or pulao, this rice can be enjoyed thoroughly just with a simple potato fry or a hard boiled egg to enjoy either for your lunch or for your dinner. I chosed cooking with capsicum as the main ingredient, an interesting theme for this week's blogging marathon.Obviously this rice is my third post for this week's blogging marathon. Check out the Blogging Marathon page for the other Blogging Marathoners doing BM#34. Red Bellpeppers have a sweet, almost fruity taste and you can prepare many dishes out of this fantastic vitamin C rich vegetable. Usually i'll add these red bellpeppers in most of the salads, i'll make soups with it or in pizzas, apart from it i'll rarely cook them with pastas or rice. Finally few days back i prepared some oven roasted bellpeppers just by broiling them in preheated oven for few minutes. While they were hot, i packed them in a ziplock bag, so that the skin can be peeled easily. This is how i prepared the oven roasted red bellpepper. Pastas are my kid's favourite, they can have pasta from breakfast to dinner, obviously i'll cook twice a week pastas at home. 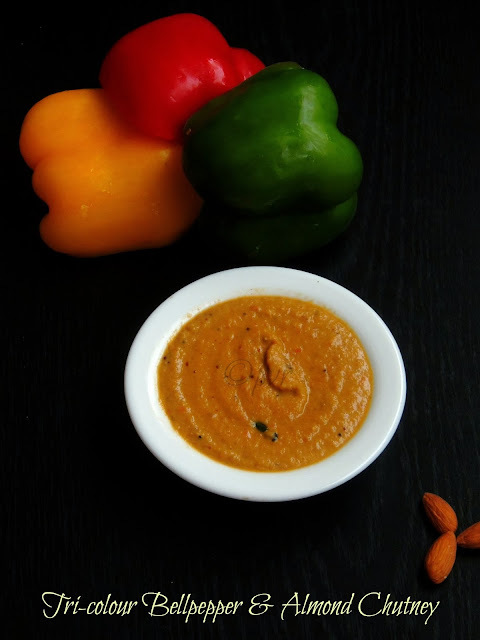 Today's dish goes for a simple roasted bellpepper sauce prepared with oven roasted red bellpepper along with onions, garlic and cream with usual spices. 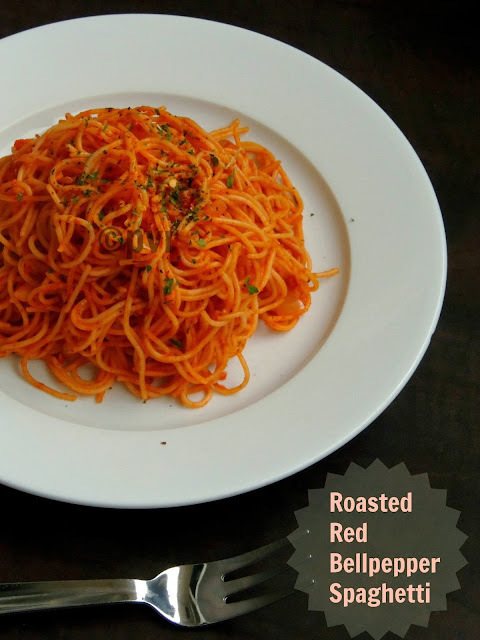 This spaghetti is one of the easiest and very quick dish you can prepared for your lunch or dinner. If you dont have roasted bellpeppers at home, you can go for the storebought ones. This is my second dish for this week's blogging marathon coz the theme of the week is Cooking with Capsicum as a main ingredient.Check out the Blogging Marathon page for the other Blogging Marathoners doing BM#34. If i make idlies or dosas for our dinner,my better half need atleast two side dish to enjoy his dinner, obviously i'll try to make variety of chutneys. Sometimes i'll break my head and everytime i'll mix and match the ingredients according to my fridge eventhough my pantry will have always idly podi. One of my recent trial is this delicious chutney with a combination of three bellpeppers along with almonds. This chutney will get ready in a jiffy, just saute the roughly chopped bellpeppers with few spices and almonds,grind it and your chutney is ready to enjoy with some soft idlies or crispy dosas.Today am starting my third week of blogging marathon with a fantastic theme, my theme for this week is cooking with capsicum as the main ingredient.Obviously my next two day posts for this week's blogging marathon is going to be delicious dishes with capsicum. We enjoyed thoroughly this chutney with these crispy Soyabean Dosa.Check out the Blogging Marathon page for the other Blogging Marathoners doing BM#34.Sending to my own event Healthy Diet-Vegetarian Side dish guest hosted by Nandoos..
Chatti Pathiri is a layered pastry made in Malabar region of Kerala. You can make both sweet and savoury version, this dish is quite similar like Italian Lasagna. Instead of paste, pancakes made with flour or pastry sheets prepared with all purpose flour are used. You can make any filling but somehow till know i crossed only non vegetarian filling, as the savoury ones are made traditionally with meat filling as like our samosas or puffs. 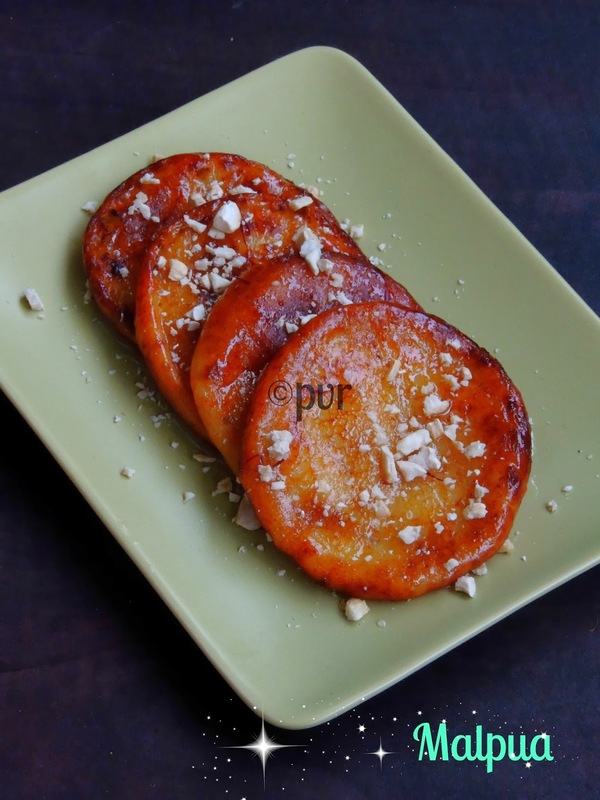 Thank god Srivalli suggested us this sweet chatti pathiri for our this month's Indian Cooking Challenge,a monthly event where we cook dishes from various regions of India. I skipped last month's challenge, coz of the sprouts eventhough i'll be making soon. But this time i dont want to miss as i seriously want to make these chatti pathiris since a long. For the today's sweet chatti pathiri, we went for a sweet filling with coconut,black sesame seeds,poppy seeds and nuts. Trust me this sweet chatti pathiri are just simply out of the world. The most important ingredient to enhance the authenticity of this dish is white poppy seeds, dont forget to add or skip them. These seeds are used extensively in Malabar cuisine. Chatti Pathiris are made during festivals, or either during a wedding event or else especially for Iftar. If you have a sweet tooth, these sweetened chatti pathiri will definitely satisfy your sweet tooth. 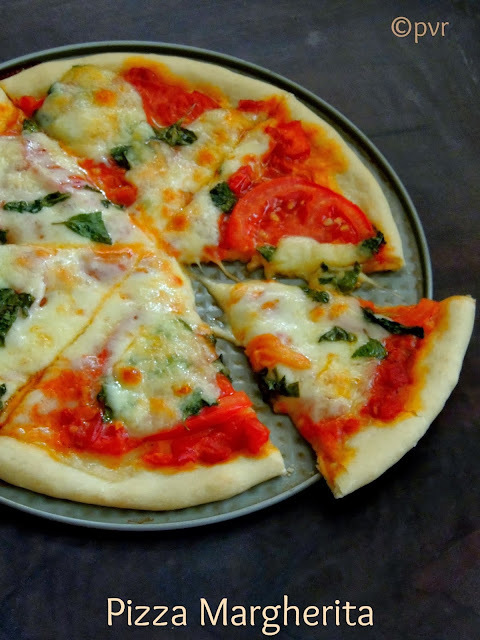 Pizza, this word itself makes me hungry, i have completely fallen in love with this Italian food when i tasted the veritable pizza margherita when we travelled to Italy few years back.Earlier i never baked pizza at home and then later i realized that making pizza at home wasnt a tough job.Once i started baking bread at home, i tried making pizza at home and every time i make pizza, it was a big hit at home. Now i dont run behind the store bought ones, pizza dough can be prepared a day before and they are conserved very well in fridge. Homemade pizzas are always the best and you can mix and match the ingredients according to your wish with vegetables and cheese available in your fridge.Coming to this pizza margherita, its one of the easiest pizza i have never prepared, and the basil leaves gives a wonderful flavour to this easy peasy pizza.Pizza Margherita belongs to Campania region of Italy and this pizza is well known all around the world. Obviously i chosed to bake them as am guest hosting this month's International Food Challenge ,a monthly event started by two wonderful food bloggers Sara and Shobana and the cuisine of this month is Campania cuisine of Italy. November 6th, when i opened the Facebook earlier in the morning with my cup of tea, i was shocked to see that the Famous Indian Chef Tarla Dalalji is no more, trust me i thought it was a rumour. But later on many updates popped at from all my friend's wall about her demise. Am a great fan of her cookbooks, i have a small collection of her books at home. Whenever i want to cook anything new, i'll go through her website and cook different dish from hers, seriously she was like one among my family members. November 6th was a painful day for me and i couldnt bear this huge loss. We cant forget few peoples, yes their memories wont go away from our heart I love Tarla Dalalji and she will be remembered forever. 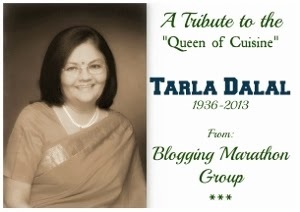 We the members of blogging marathon wanted to post a tribute to this great chef and immediately some members started their plan, but from my side i was like shall i go r not coz of my busy schedule with my trip to India, but somehow i dont want to miss this tribute post that too for my favourite Tarla Dalalji. 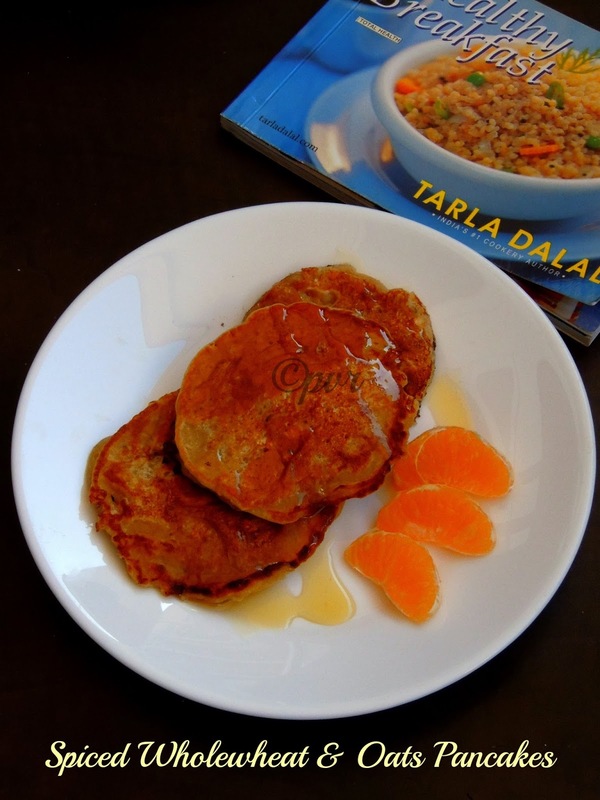 Then today morning, i quickly went through her cookbook and picked this healthy spiced pancakes with wholewheat and oats for my breakfast.Tarla Dalalji's recipes comes out well whenever you cook from her website or from her books, she is one among the chefs who give recipes with accurate proportions. Tarla Dalalji, may your soul rest in peace. Writing a guest post to a fellow blogger, is definitely a proud moment for a blogger like me. I never said no if any of my co bloggers asks me to write a guest post. I did quite often, and most of the time i forget to write a special post regarding my guest post in my space. Sorry dears, actually let me say all coz of the lack of time or my laziness. Never mind let me catch up with those guest posts i have done specially for few bloggers before few days or may be a month back. First i want to write about the guest post i did for Avika's A day through my life, sorry Avika am super late in writing about the guest post. Avika Nair asked me to write a guest post just to keep her blog alive during her trip to India and she kindly asked me to bake something for her. How can i say no to a darling sister, that too she asked me to bake. Obviously i said immediately Yes and baked a Eggless coconut custard buns specially for her. She have posted this buns at her space on 30th september,see how late am writing about this guest post.But trust me, its not too late to visit and enjoy this eggless custard buns with tangzhong method.Do check Avika's space for this guest post..
Avika write about many traditional dishes at her space, especially Kerala dishes. Whenever i go through her space, she never failed to tempt me with her beautiful clicks. I have bookmarked few of her dishes, dunno when am gonna make them,God only knows. Avika,keep on going sis. Second comes this beautiful swirl rolls i prepared for Shazzy's Seasoned With Shazzy few days back. 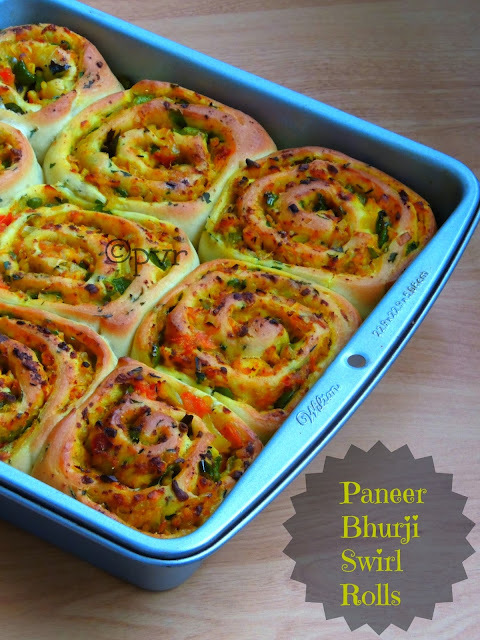 Shazzy pinged me few days back asking me to write a guest post for her, i immediately said yes and prepared her these swirl rolls with the famous paneer bhurji. I crossed Shazzy's blog through Home baker's challenge and started visiting her space. 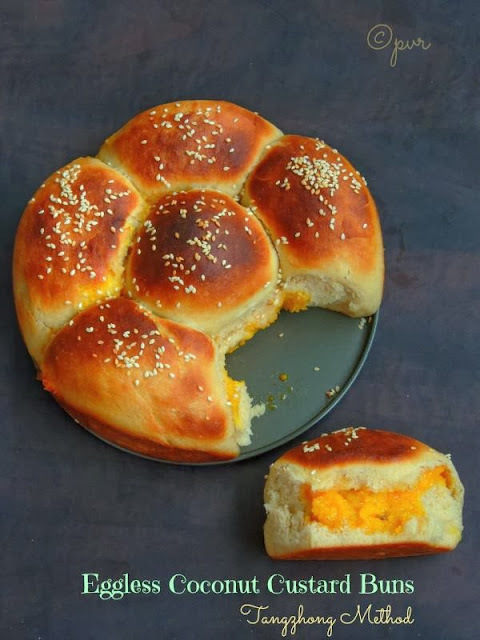 She shares different and delicious dishes in her space and you will definitely drool on seeing her posts.Check out my Paneer swirl rolls at Shazzy Space here. Coming to this Dates & chocolate brownies, this post is somehow special coz i prepared specially to a good friend of mine. Yes Menaga of Sashiga is a wonderful friend, who never fails to call me through fone whenever she feel like talking with me. We are from same city and living in same country, how fantastic na. Not only she is my friend, she is more than that. She was very supportive when i crossed a difficult moment in my life, i never forget those days how wonderfully she consoled me. She call me without any fail to wish for me on every special days of my life. I know she will be there for me whenever i want her. We speaks for hours and we are not only friends, i can say that we are more than that. Menaga writes her blog in my mother tongue Tamil. She shares many traditional,nutritious and very healthy dishes in her space. Not only Indian dishes, but she also share many International dishes there. Am a great fan of her healthy dishes, everytime i go to her space she never failed to surprise me with her own way of cooking with different ingredients. Keep on rocking Menaga, i love ur space very much and obviously i dont need to say how i treasure our friendship. 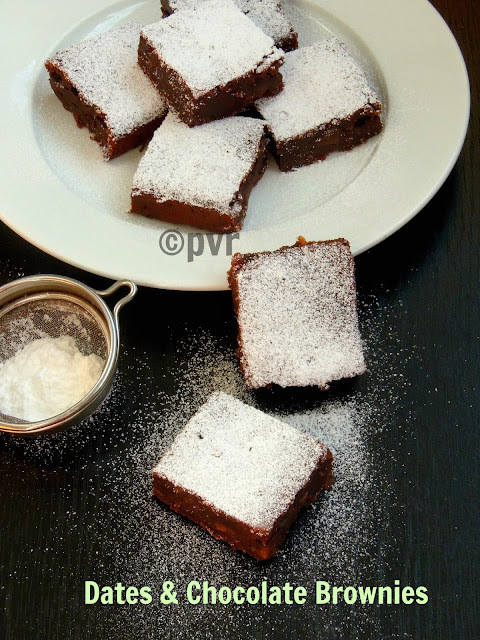 Check Menaga's space to know how i baked this ultimate Brownies..
Hope you all enjoyed my guest posts i have prepared and written specially for them with stepwise pictures in their space. Please do go through and leave your encouraging words. Preparing a lunch box for school going kids is definitely a big task for most of the Indian mummies. Thank god, i dont have to prepare lunch box for my kids. Since i want to go through the experience of packing foods for kids, i chosed this week's theme for blogging marathon as Mess free tiffin box. 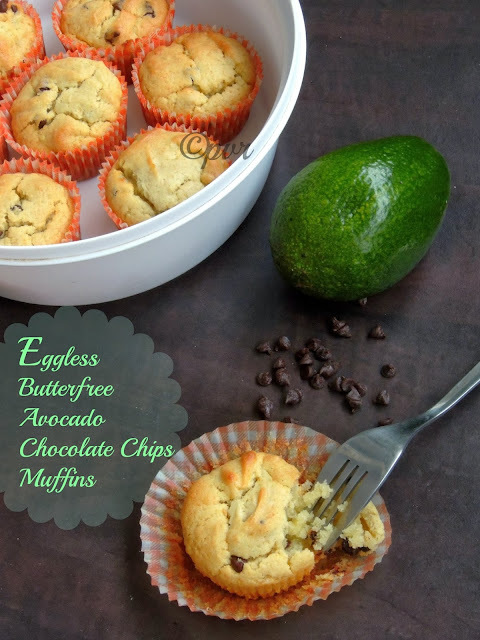 After posting biscottis for a simple snack box and a healthy nutritious sandwich for a lunch box, today am landing to this yeasted muffins.Y i named this beautiful dish as muffins, coz instead of making stuffed buns, i simply went for a muffin tray for making this stuffed beauties, so that you can get a prefect muffin shaped stuffed buns. 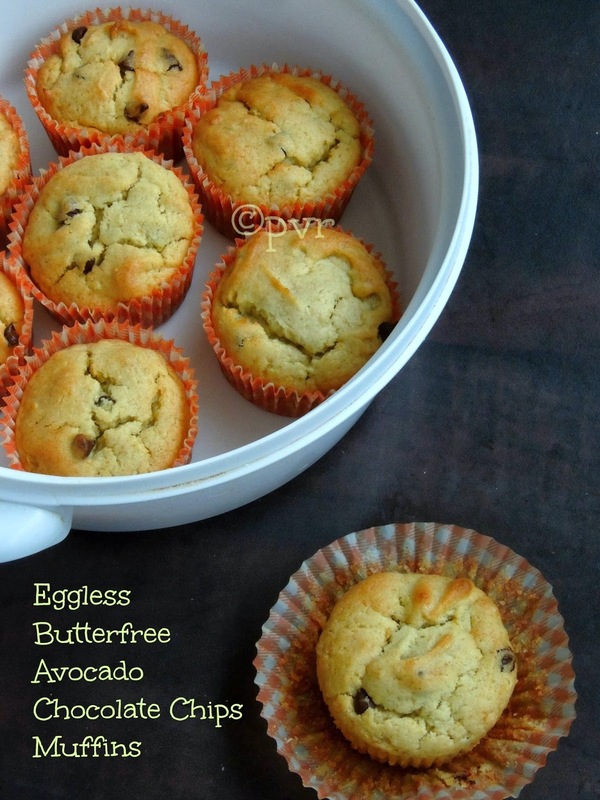 I used an eggless, butterless bread dough for making these stuffed yeasted muffins.These yeasted bread muffins stays super spongy even after a day,if you conserve them properly. With a simple salad, this yeasted muffins makes a wonderful lunch box for any ages. I went for potatoes and paneer cubes for the stuffing masala, kids will definitely enjoy the filling and their lunch box.You can definitely see the empty lunch box if you pack this yeasted muffins.Check out the Blogging Marathon page for the other Blogging Marathoners doing BM#34. I know in most of the Indian's home we will pack lunch and snacks for schooling going kids everyday, but here in Paris, i dont pack foods for my kids as their schools are just 5minutes by walk from our appartement, but i pack foods for my H as he dont like to have French foods everyday in his office canteen. My kids come back home for their lunch everyday obviously i wont stress or strain for preparing everyday their lunch at home.Since i want to live the experience of preparing a lunch box, i chosed this week's theme of blogging marathon as mess free tiffin box.So i prepared three different dishes which fits prefectly for this week's blogging marathon theme. After a biscotti, am gonna share a protein rich sandwich which goes for a super quick soya bhurji which is simply prepared with soya nuggets. 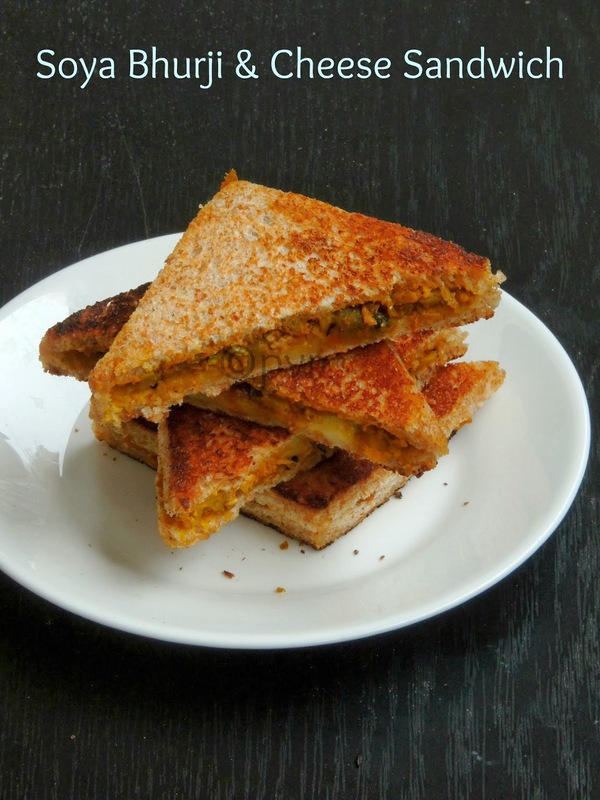 Soya bhurji is prepared as much as like the famous egg or paneer bhurji with usual spices. My elder son is not a fan of these soyachunks obviously i'll try to add them as much as possible in his diet by cooking them with other ingredients. Since he love mozzarella cheese very much, i prepared this sandwich with soya bhurji and mozzarella, trust me he simply finished his plate and asked me for an another sandwich, i was happy that he had two sandwiches without even knowing the secret ingredient i have hidden in this sandwich..Check out the Blogging Marathon page for the other Blogging Marathoners doing BM#34. Biscottis are a type of cookies baked twice and it an Italian cookie. Usually these cookies or biscuits are oblong shaped and they are well known for their crunchiness. Since these cookies are baked twice they can stay prefect for a long if they are conserved properly.For our this month's Home Baker's Challenge,i have to became the host of the month at last moment coz the host of this month couldnt able to do the guest hosting, thank god i pinged earlier to know about the status of her recipe choice then only she told that she cant do the guest hosting for this month. When i was searching for a easy bake, i thought these Italian cookies will be quite interesting as some of the members of Home baker's group would have rarely tried their hands in making biscottis. I chosed two savoury biscottis and two sweet biscottis, coming to this eggless oats chocolate biscottis its one of my creation. Actually while chosing the biscottis recipe, i couldnt able to get this fabulous Italian cookies with wholegrains, but finally i decided to bake this crunchy super chocolaty biscottis with rolled oats. They came out extremely prefect and obviously they were quite addictive. You cant stop with one biscottis if you bake these oats chocolate biscottis at home.You can pack these biscottis to kid's snack box as these biscottis have the incredible grain 'Oats', for the second week of blogging marathon i chosed the mess free tiffin box theme and am posting this scrumptious biscottis for this week theme as they fit very much for the theme..Check out the Blogging Marathon page for the other Blogging Marathoners doing BM#34.Its 1st sunday of the month and since i belong to a group of friends who blogs on sunday for the event Let's Brunch On Sundays am posting this biscottis for this event too. For me after Pizza, spaghetti means Italian food. I tasted spaghetti for the first time with some cheesy creamy sauce, immediately i have fallen in love to this Italian noodles like pasta. Since am the host of this month's International Food Challenge ,a monthly event started by two wonderful food bloggers Sara and Shobana i was searching for an interesting spaghetti dish and while googling i crossed this spaghetti alla puttanesca which sounds prefect for me as this recipe goes for my favourite anchovy fish and olives. This dish goes seriously for a very quick and easy preparation and my kids enjoyed thoroughly this tangy,fishy spaghetti.Instead of normal tomatoes, i used cherry tomatoes for making this spaghetti and those addition of cherry tomatoes makes the difference in this dish. 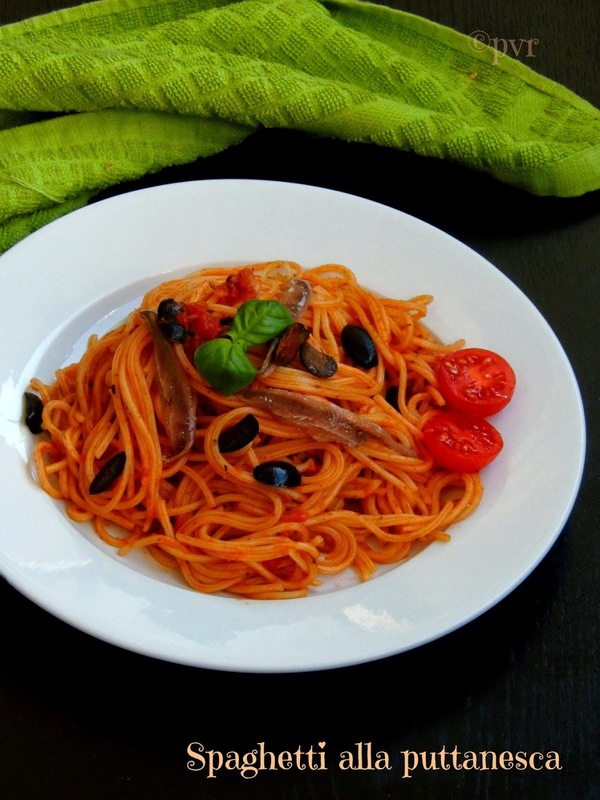 You can skip anchovy fillets by using soya granules or tuna fish if you dont like anchovies. 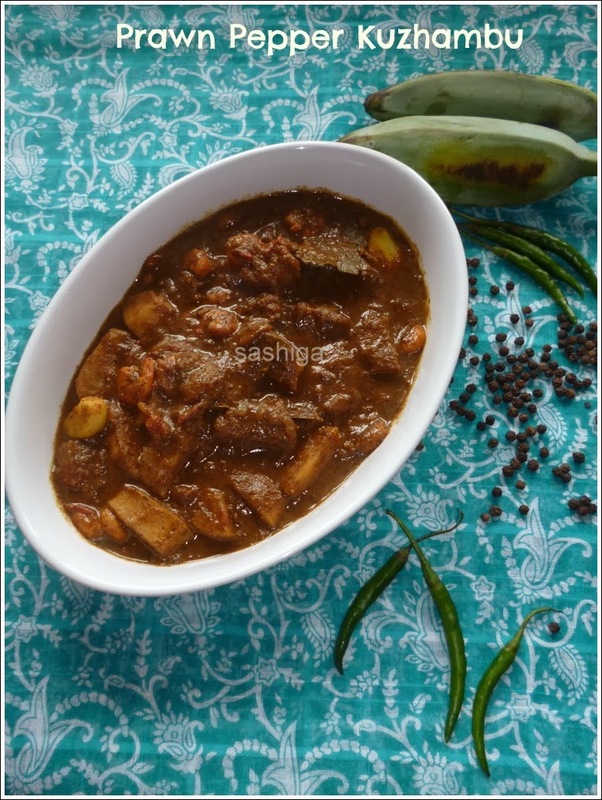 I love shallow fried foods than the deep fried ones, coz shallow frying goes for less oil when compared to deep frying.But sometimes instead of shallow frying or deepfrying, i'll go for pan roasting vegetables which goes awesome as side dish with a simple comforting dish like sambhar rice or rasam rice. One among those pan roasted vegetables, here comes an easy breezy,delicious and a very tasty side dish i quickly prepared for our lunch with baby potatoes few months back. Baby potatoes gets cook easily that the usual potatoes,obviously these tiny potatoes tastes fabulous for making this kind of quick side dishes. You dont need to chop onion or grind any special masala for making this pan roasted baby potatoes, just chilly powder and coriander powder is enough to spice them. 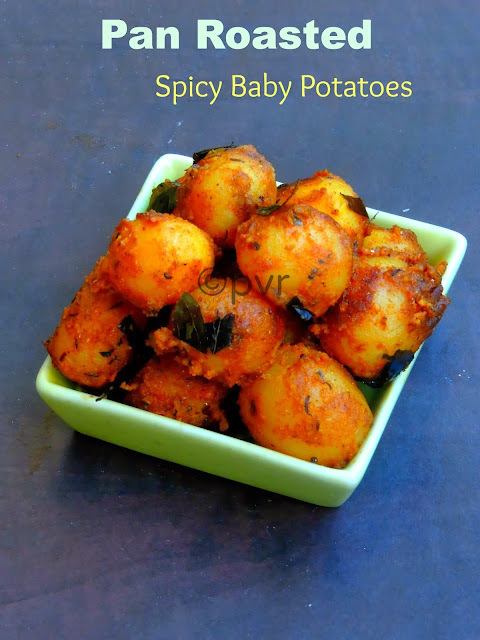 If you love potatoes very much,you can also serve this cuties as a starter, am sure this dish is definitely a crowd pleaser.Make this quick dish and feed your family if you feel lazy to cook..Today is the first thursday of the month and its time to post for Vegan Thursdays, an vegan event running twice. My readers and followers will definitely know about the monthly event happening twice here. Rendez vous with a foodie, this event is specially for newbie bloggers who started their blog recently. Do you want to showcase your blog to this immense virtual bloggy world, then join me and send me your guest post. This event is going successfully since ever i started and a bunch of my co bloggers showered me with their love by joining their hands with me. Nothing is impossible with all your constant supports and encouraging words.Every 7th and 20th of the month, a guest aka a newbie blogger will post her dish in my space along with their replies for few questions i'll be asking for. So that we can know a bit about them and get to know about them through this event. Do you want to join, then leave me your mail address or else join us in Facebook group. Life is not full of roses,but sometimes we can make changes in our life if you have good and humble friends besides us.Trust me, my life have changed a lot since few years, that too in this virtual world. I have few friends who are my soul mates, blog mates, my chat mates etc etc. One among my chat mate aka soul mate is Sangeetha of Spicy Treats, actually we have the same wavelength obviously we became friends easily. Since we have the same passion for foods, we are very close to each other now. Earlier we used to talk through Facebook, then one fine day i got her number and called her. From that day onwards, we came so closer and we talk for hours and hours through fone.We know each other very well, if i feel down or if am happy, i'll immediately share with couple of my close friends aka bloggers. When i lost my father, Sangeetha was one among those friends who didnt hesitate a second to call me while am crossing a difficult and very painful moment of my life. Sangee, i can speak for hours about her,no no for a whole day oh no may be month, yes she have that much of qualities to say. Actually am lost with words now, i seriously want to find a new definition for the friendship that i share with Sangeetha, its a sister-friend relation which i treasure a lot.Sangeetha is a wonderful friend, very honest friend, a down to earth person who speaks always from her heart and a darling if you get to know more about her. She is busy mom of two cute and charming boys, eventhough they keep her busy Sangee never failed to take care of her blog baby. 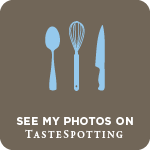 She feeds her blog baby very regularly by her fabulous clicks with stepwise pictures.Couple of her recipes are my favourites and i can provide a huge list of my favourites from her space. Am honoured that finally Sangee is my guest host today and happy that she made this guest post specially for me. Thanks again Sangee. Mozzarella is our favourite cheese, either in a salad or in a pizza seriously i love to add this cheese very much. Obviously i always have a couple of mozzarella balls in my fridge, they are seriously handy and you can make any dish out of this fabulous cheese. 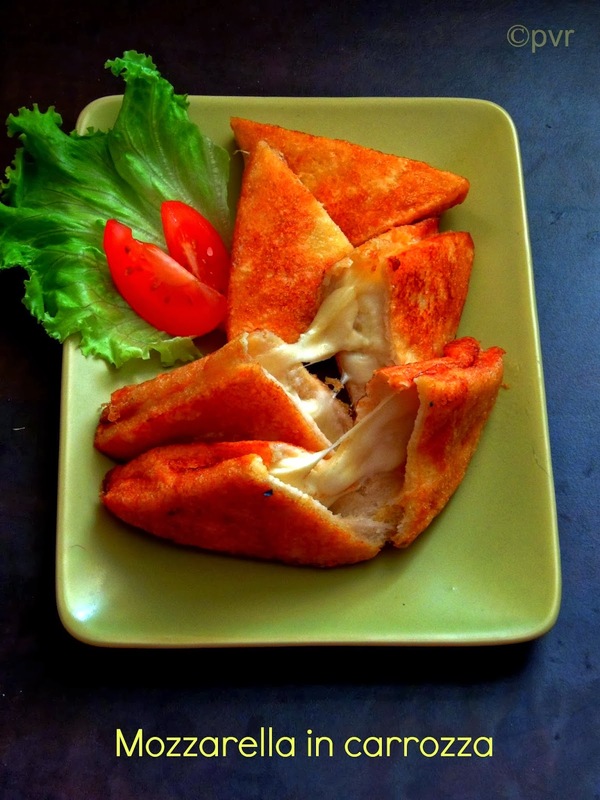 For my today's post, am here with an interesting dish with mozzarella and bread slices. This dish may sound almost like bread toast, but this mozzarella dish goes for deep frying, apart from it anyone who loves mozzarella will definitely go mad after tasting this fried mozzarella in a carriage. With simple ingredients, you can make a fantabulous evening snacks with mozzarella,bread slices and egg. You can also serve this fried mozzarella as an appetizier too, this recipe goes for egg if you dont want or dont like eggs, you can skip it and prepare this dish with a simple flour coating as you need to coat the mozzarella stuffed bread slices with egg coating.This post goes to this month's International Food Challenge ,a monthly event started by two wonderful food bloggers Sara and Shobana, coz am the host of this month's challenge. 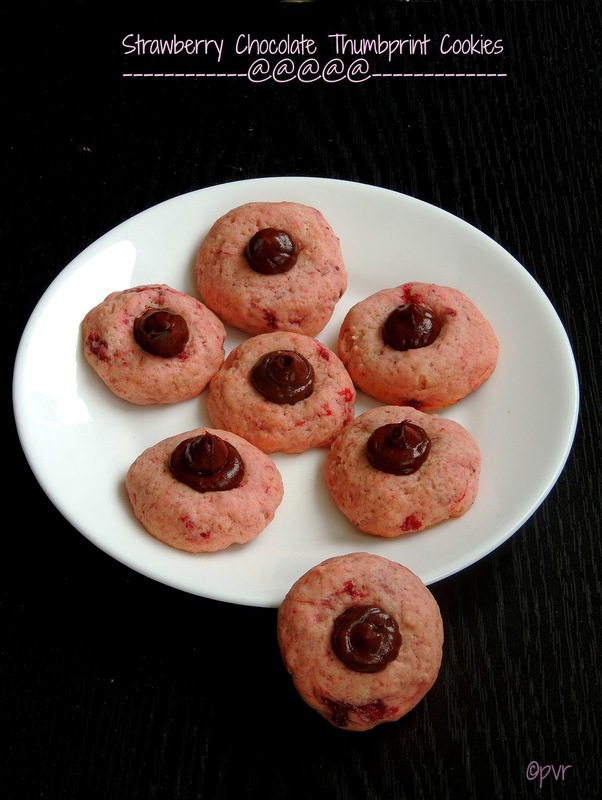 Thumbprint cookies goes always for shortbread like very buttery and melt in mouth texture cookies. These cookies are seriously very addictive and one of my favourite cookies are simple vanilla and chocolate thumbprint cookies. Today's post is prepared with a fruit pulp that too strawberry pulp, actually these cookies are suggested by Viji for Home Baker's Challenge but somehow i couldnt post these strawberry thumbprint cookies earlier. But thank God these pretty attractive cookies fits prefectly for this week's blogging marathon theme. Theme of this first week is cooking with fruits and i chosed berries from the list given by Srivalli. After rasgullas and eggless pudding, hope you all will definitely love these scrumptious cookies with strawberries.If you dont get the fresh strawberries, you can still make these cookies with frozen strawberries too, but if you using frozen berries, take care not to add water and make the pulp very thick else your cookie dough will turn watery and your cookies will get flatten easily while baking, they wont retain their shape. Kids will definitely love this cookies and none can stop just with one after having these cookies, yes they are seriously very additive.Check out the Blogging Marathon page for the other Blogging Marathoners doing BM#34. Pudding goes always for eggs, but my today's post is completely an eggless, gelatin free, agar agar free pudding. You may think then how i made this pudding. 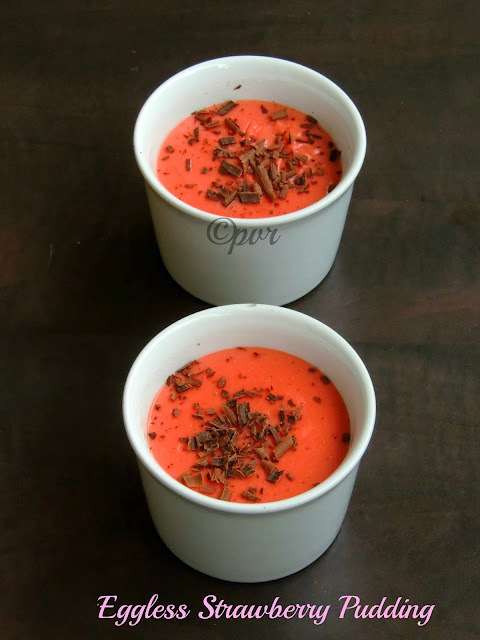 Ok let me say what i used for making this eggless strawberry pudding, i used the humble vanilla flavoured custard powder for making this pudding. Seriously this pudding is one of the easiest, very delicious, fruity and an excellent light dessert after a heavy meal. Actually i used frozen strawberries for making this pudding coz its not strawberry season here.Since i freezed earlier some super fresh sweet strawberries, they are really handy now to make this kind of quick and easy desserts whenever i crave for some strawberry desserts. This is my second post for this week's blogging marathon under the theme Cooking with fruits, Srivalli gave a list of fruits for us to choose and cook from the list. I chosed berries and cooked with strawberries.After a Bengali sweet with strawberries i prepared this fantastic pudding with some frozen strawberries, we just enjoyed thoroughly this eggless chilled strawberry pudding after our Sunday lunch.Check out the Blogging Marathon page for the other Blogging Marathoners doing BM#34.If you want to make this pudding with chocolates,just go for chocolate powder or melted chocolate. Rasgulla, rassagollas or rasagullas, this juicy Indian cheese based sweet is popular all around the world and its particularly famous in Indian states of West Bengal and Odisha.Rasgullas is made from a ball shaped dumpling of paneer, the famous Indian cheese cooked in sugar syrup. 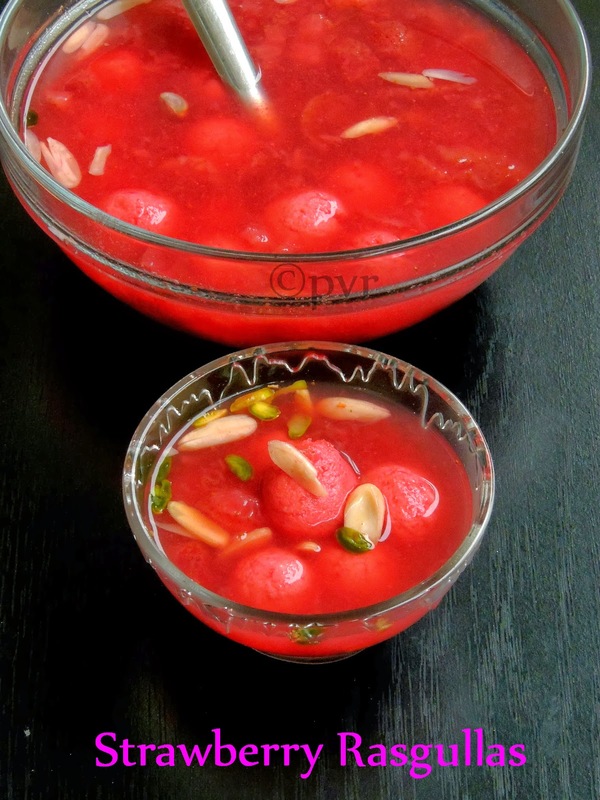 Coming to this strawberry rasgullas, i chosed to make for this week's blogging marathon. The theme of this week's blogging marathon is cooking with fruits, Srivalli the brain child of this monthly event suggested few fruits and obviously we need to cook from the list of the fruits she have given. I chosed berries and my favourite strawberries, eventhough its not strawberry season here. I have already freezed some fresh strawberries during their peak season for further use. Frozen strawberries are seriously very handy and you can make many desserts with them. Coming to this rasgullas, i made a puree of strawberry and some finely chopped frozen strawberries while preparing the sugar syrup in which the paneer balls are cooked later. I didnt used any food colour and these cheese balls got their colour from the strawberry-sugar syrup while cooking.Check out the Blogging Marathon page for the other Blogging Marathoners doing BM#34.This beauties are going Diwali Delicacies Event, hosted by me and Sangee Vijay of spicy treats. Litti Chokha is a traditional snack and a main course dish often eaten in UP, Bihar and Jharkhand region of India. But this the first time am trying my hands in making this fantastic dish. This dish is simply awesome and highly filling that you can have it for breakfast, lunch and for dinner. Actually Litti sounds almost like Rajasthani Baati but Litti is completely different dish in terms of taste,texture and prearation,its goes for stuffing with roasted gram flour with few spices.The stuffing makes the difference and the stuffing of the Litti is called Pitthi. Litti is served along with grilleded eggplants or mashed potatoes called Chokha.Chokha is a kind of accompaniment to enjoy thoroughly with Littis, today chokha is with just potatoes, eventhough some peoples may add both eggplants and potatoes in their chokha. You may wonder why am posting this Litti Chokha today, coz Nupur of Uk Rasoi challenged the Southern team of South vs North Challenge an event owned by Divya Pramil with this fantastic combo while i challenged Northern team with popular Mangalorean snack Goli Baje. Honestly i always want to make some Litti at home but somehow i kept myself away from this incredible dish coz of the sattu, but Nupur helped us by giving the tips to prepare sattu at home and for me sattu sounds exactly like a dry roasted gram flour, then i pinged Nupur regarding sattu, she said to go with roasted gram flour. Thanks Nupur for giving me this much liberty to go for a simple roasted gram flour than the traditional one. However i'll be making Sattu at home coz am planning to make kachori with this sattu. Coming to this Litti Chokha, am gonna have this Litti Chokha for my dinner tonite and trust me the flavour of ghee coated Litti and delicious Chokha makes me hungry already. Atleast once,you guys have to make this oven cooked Litti eventhough the traditional one is boiled and shallowfried later.Loved this challenge and learned an another beautiful traditional dish today through this challenge. When the weather is down or rainy, seriously i love to munch some fried beauties for my evening snacks with a cup of masala chai. When i came to know that am the host of this month's South Vs North Challenge, an event created by Divya Pramil of You Too Can Cook, i know i'll be preparing a deep fried evening snacks. The motto of this event is to exchange an Indian recipe between two teams. One team is Southern team (food bloggers born and brought in South India) and the another one team is Northern team (food bloggers born and brought in North India).Every first of a month, a blogger from each team will challenge a recipe from their origin and the opposite team have to cook the recipe challenged by the other team. Am very much happy to say that i got an immense opportunity to challenge again the opposite Northern team for this month on behalf of Southern team. I have to say a big thanks to Divya for giving me this opportunity again after challenging the opposite team with one of my grandma's signature dish, the famous Chettinad Pakoda Kuzhambu few months back. 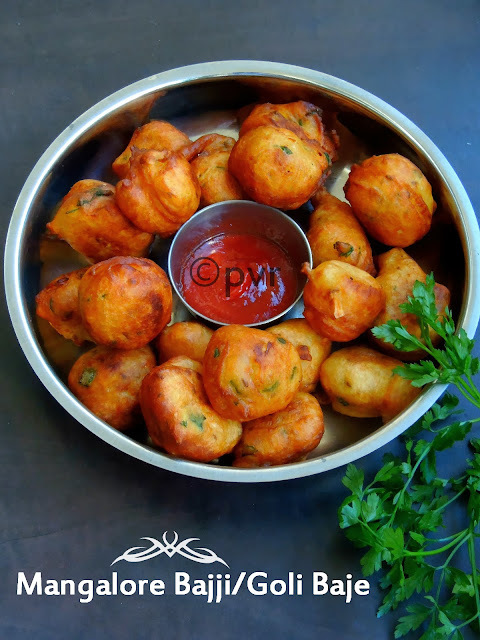 Coming to today's recipe, instead of making Tamilnadu foods i picked this addictive snack food from Mangalorean cuisine.Goli Baje or Goli Bajje, is a famous deep fried snacks which is quite popular in South Canara. This tea time snacks sound almost like Tamilian's Urad Dal bonda but this goli bajje are quite easier than urad dal bonda. With simple ingredients this deep fried beauties are prepared without any hassle.No grinding, no soaking and no onion or garlic, yes this Mangalore bajjis goes for an easy breezy preparation. Traditionally this bajjis are served with coconut chutney but somehow i love mine with ketchup, however this bajjis doesnt even need any side dish. 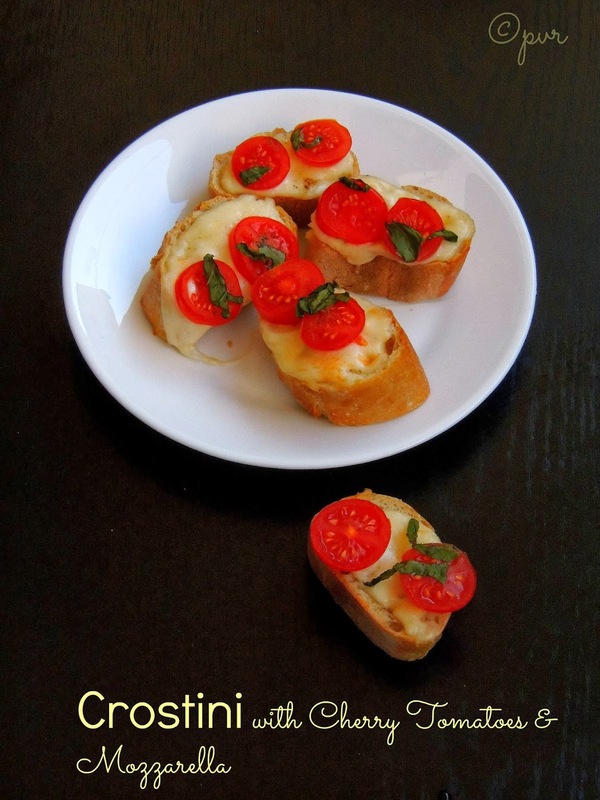 Crostini are small toasts in Italian and they are prepared as an appetizer. Crostini is prepared with small slices of grilled or toasted bread with cheeses,meats and vegetables as toppings or else they go for a simple olive oil and herbs or else with a simple sauce. Crostini goes always for French or Italian baguettes, a simple appetizer which goes for a quick preparation with simple ingredients.Crostini is almost like bruschetta eventhough bruschetta can be served as a snack or as an appetizer. For this month's International Food Challenge , a monthly event started by two wonderful food bloggers Sara and Shobana,I suggested few Italian dishes and one among those dishes i challenged the other members of the group is this Crostini with cherry tomatoes and mozzarella.This crostini takes hardly 15 to 20minutes to get ready and they are a prefect appetizer for a get together or else for a party menu.